[April 06, 2007] Harry J. Long, 83, of New Holland died Friday, April 6, 2007, at 9:13 a.m. at Maple Ridge Care Centre in Lincoln. 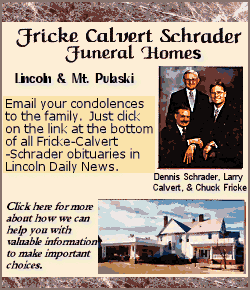 Visitation will be from 4 to 7 p.m. Monday at Fricke-Calvert-Schrader Funeral Home in Lincoln. His funeral will be at 10:30 a.m. Tuesday at New Holland United Methodist Church, with the Rev. Julie Azbel officiating. Burial, with military rites, will be in Richmond Grove Cemetery, New Holland. Mr. Long farmed in Sheridan Township for 40 years before he retired. He was born May 25, 1923, at Manito to William C. and Lucy Redman Long. He married Betty Badgett on April 7, 1943, in Bowling Green, Mo. He is survived by his wife, of New Holland; one son, Gary (and Karen) Long of Lincoln; two daughters, Gail (and Floyd) Aper of Normal and Gwen (and Dave) Armintrout of Mechanicsburg; seven grandchildren; and 13 great-grandchildren. He was preceded in death by two brothers and one sister and was the last of his immediate family. He was a member of New Holland United Methodist Church, where he was a trustee and member of the Men's Club. He was Sheridan Township supervisor, New Holland volunteer fire chief, New Holland American Legion post commander, and served on the New Holland school board and the board of Richmond Grove Cemetery. Memorials may be made to Maple Ridge Care Centre, New Holland United Methodist Church or the donor's choice. Click here to send a note of condolence to the Long family.